106 I WRAPS I 2015 T o o l s & e q u i p m e n T • Design in Photoshop and design at full size and full resolution. 100 ppi at final size for small vehicles and 50 ppi for large trucks. • Use a template that is accurate for the vehicle. • Save the file as a TIF file. • Look at the TILES in your RIP and try to make the panel overlaps in an area of the wrap that makes the installation easier. • Use a RIP that rotates every second panel. • Make sure you turn on the label on the panels so you know what panel is what. 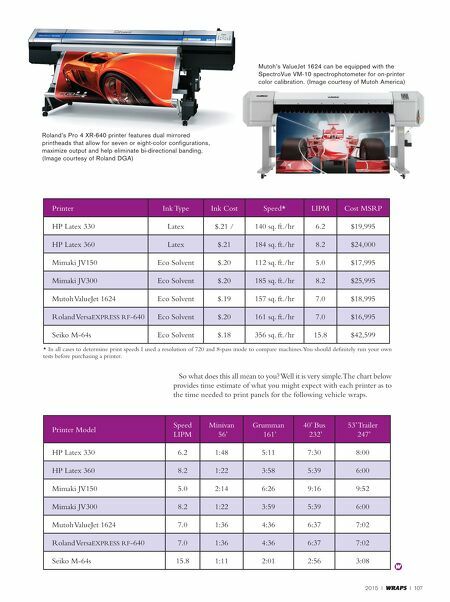 The 64"-wide HP Latex 330 Printer is a viable wraps printer using Latex water-based Inks and produces durable, scratch-resistant prints. (Image courtesy of Hewlett-Packard) Hewlett-Packard's HP Latex 360 printer. 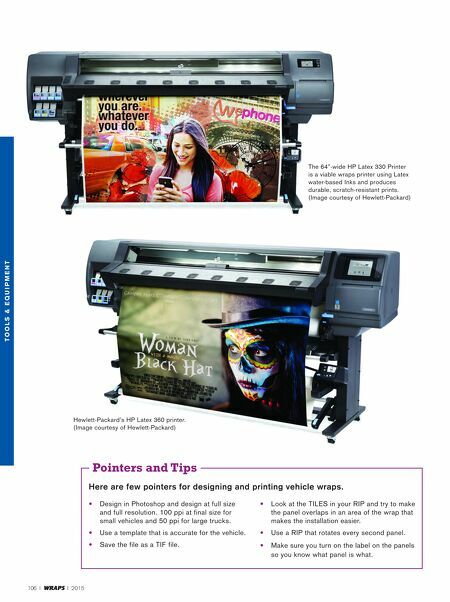 (Image courtesy of Hewlett-Packard) Pointers and Tips Here are few pointers for designing and printing vehicle wraps.